The final leg of this first etap took Dolphin Dance from Ystad to Copenhagen. 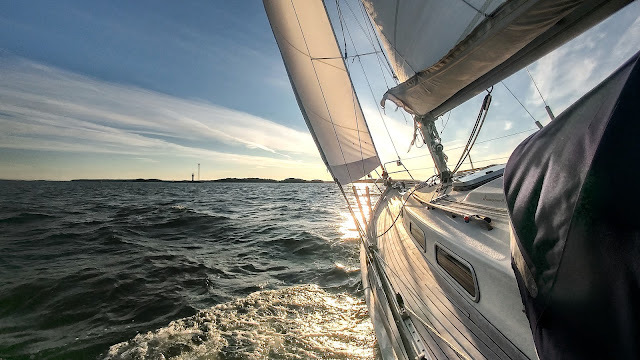 The distance via Falsterbo canal is about 55 nm so I decided to wake up early on Wednesday morning and head for the sea. But at 7 am there was thick fog over Ystad harbour so I went back to sleep and when I woke up an hour later, the fog had faded away and sun was shining. But just after 15 minutes after the departure I found myself again in middle of thick fog with visibility less than 50 meters. I turned on the AIS and drove off from the shipping lane. While AIS is great tool for monitoring ships it cannot replace radar since other boats do not show up in the AIS. Few sailing boats passed quite close by, but they seemed to have radar so they clearly had spotted me. After few hours the fog faded away, easterly wind started picking up and I was able to sail about three hours downwind. The sun was shining and Dolphin Dance sailed nicely so I did not want to rush up. But when I started to look for (apparently too late) information on Falsterbo canal, I noticed that the bridge is open every full hour excluding 8 am and 5 pm. At this speed I would have arrived there about 4.30 pm so one and half hours of waiting did not seem tempting. The GPS chart plotter showed that distance to canal was about 6 nm and I had one hour to get there. 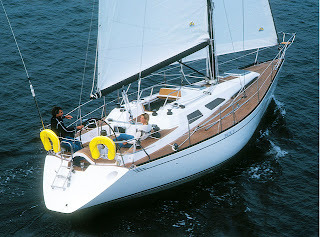 I turned on the motor, kept mainsail up and tried to steer as straight as I could and keep the speed over 6 knots. I arrived to canal entrance two minutes before the full hour, took the sail down and motored at full speed towards the bridge. But what I did not know was that the opening bridge is at the western side of the canal so I did not have enough time to get there in time. The bridge closed right after few boats had passed and consequently, I had two hours for the next opening. Fortunately I managed to find good berth by the canal and had time to make some lunch. At 6 pm I finally got through the canal. Strong rain had been forecasted for the evening so I decided to stop at Falsterbo Höllviken harbour, which is located right after the bridge. However wind had also got stronger and the harbour seemed to be too exposed to winds. Furthermore, there are piles in the harbour which I do not like using when singlehanding especially when it is windy. Thus, I decided to continue towards Copenhagen. The forecasted heavy rain started after 8 pm and there were also some lighting in the area. This time thunderclouds were closer and wind increased towards the evening. I looked for good harbours near the Kastrup airport from my Garmin GPS chart plotter and found the Kastrup Strandpark a few miles north of the airport. The Garmin plotter (525s) is very handy when sailing in unfamiliar waters since one can find information on all the harbours in the area. The database contains information on facilities and services and also very useful satellite and areal photos of the harbour. Kastrup Strandpark turn out to be an excellent choice for my needs. Most of the places in the harbour are resereved but free places are marked with a green sign. All the facilities were new (actually best during our journey so far) and free Wi-Fi connection at the harbour. There is also a good maritime store right in the harbour, where I could change one Campingaz bottle. Connections to airport and downtown Copenhagen are good. However, noise from nearby airport can be little disturbing. It is now time to leave the boat to Kastrup since I am going back to Finland for a few days. To sum up this first etap, we were eventually quite lucky with the weather and did not have strong winds but in the beginning. We made all the long crossings mostly under sail. Total miles logged were about 550 nm and engine run about 48 h from total of 114 h spent at sea.